All of my life I've been terrible at giving presents, mainly because I don't wait for a present giving opportunity, thus robbing myself of a good present when I need to give one. My husband is turning 27 in less than a week, and following our great Christmas this year - seriously we did awesome giving great gifts to friends and family - I got him, what I think is a fantastic present! Mind you, he may not necessarily deserve this fantastic present, as his great idea of a birthday present for me was Bauer hockey skates. Please ask me if I skate. The answer is NO. 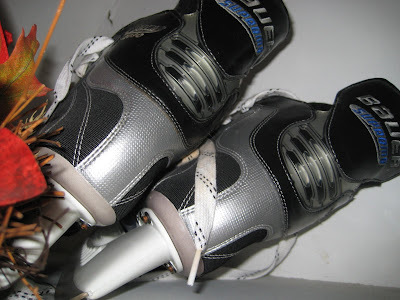 Tony bought me a $200 pair of hockey skates to use once a winter because he thinks it's sweet to skate with me. Fine - but he bought hockey skates for me, for him! 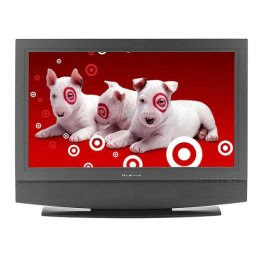 So anywhoo months ago, I bought him a fricken sweet present, which even now I'm scared to name, because even though he doesn't read my blog, it's such a big deal - augh what the heck, I bought him this, a 37" HD Tv: Target had it on the front cover as a blow out, I used my 10% employee discount (like I said months ago), 10% Target credit card coupon and I paid $150 in cash from serving tips. It was my plan to use my Acapulco serving money to pay it off inconspiculously . . . but then I quit Acapulco when I got my present job. Therein lies the problem. Tony pays for a service through which he is able to daily pull his outstanding debt and receive his credit score. He's had it ever since we've met and for some reason, decided yesterday was a good idea to sign me up for the same service! So I had to lie through my teeth about the balance on the Target card!!! Although he specifically asked is that dollar amount really on there, and I truthfully said No because the balance was from the previous statement . . . I hate lying to him, but honestly, less than a week before your birthday?! Ack! Doesn't that timing just freaking figure! But don't worry about the lying...you'll be able to tell him the truth after you give him the gift. And what an awesome gift it is! YOu only have a week to go and he'll love it!!! This is definitely one circumstance where lying is okay. Tony will love it! Although, you shouldn't spoil him considering the gifts he gets you!